You will probably like this game if you like chess. 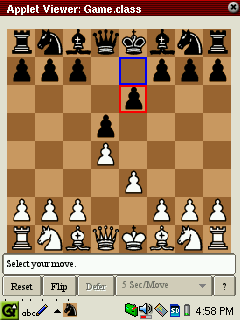 Javachess is a simple but nice chess game written in Java and therefore suitable for the Zaurus. It is easy to use and plays nice. Although the graphics is simple (no special themes and figures available) the figures are very easily recognized and playing is smooth. However, the game has a few drawbacks which prevent a higher rating. First, of all it lacks some features (e.g. promotion of pawns is only possible to a Queen) and second it has some bugs, as e.g. it does not recognize check-mate and one has to kill the King to end the game. This is especially annoying if you do not move your King out of a Check and the game ends by the opponent killing your King... Furthermore, the computer player seems to be quite weak and needs to think long for better moves compared to other chess engines. Despite, the weaknesses the game is nice for a quick chess game in between. I find myself often coming back to it for a game or, too. And having a weak computer opponent can also have advantages concerning your motivation... So certainly, this game is not for professional players but a good start for beginners or occasional players before you move on to a stronger program (as e.g. Knights).